Changing time zones and red-eye flights aren’t the best way to ensure you get your beauty rest, but I have a few travel tips that should increase the chances you’ll stay healthy and rested while you’re on the go. They certainly aren’t the height of fashion, but an eye mask can help block out light while you rest your eyes. Spring for a comfortable mask since it’s no good if you don’t wear it! There are some interesting hoodies and coats that are meant to act as an eye mask and pillow, but I’ve never tried them myself so I can’t vouch for them. If you’ll be traveling for a long time you might want to consider bringing your own pillow. Choosing the right firmness for your pillow takes some effort and you might not want to rely on the hotel, Airbnb, or hostel you’re staying at to provide you with the perfect pillow. Of course, this might be unpractical for a short trip or if you’re working under luggage restrictions. Depending on the temperature of your destination (or destinations!) make sure you won’t be too cold or too warm to sleep. The ideal sleeping temperature is 70°F so pack some light sleepwear or a blanket to get you close to that. You may also want to consider wearing socks to bed. Feet have the worst circulation and tend to get colder before the rest of the body. Some people choose to sleep during their flight then stay up for an extended time once they land. Others choose to do the exact opposite. It doesn’t particularly matter which method you use so long as you make that decision early on. You’ll want to plan 6-8 hours of sleep for yourself either way. After your first night, try to keep a regular bedtime, especially for extended trips. About 2 hours before you plan to sleep don’t eat or drink anything. If you do, you’re more likely to need to use the bathroom during the night which will interrupt your sleep cycles. I know it can be tempting to grab your complementary alcoholic beverages on international flights, but you’ll have a better time on your trip if you’re rested. If you want to eat a snack, choose a high protein snack that won’t make you too thirsty. The protein should help with your melatonin and serotonin production and aid in keeping you sleeping. Reading will prepare your mind for sleep better than watching TV. You might want to choose something that’s low action or low drama. A thrilling mystery won’t help you rest your mind! If you don’t want to read, at least avoid watching TV. It disrupts your pineal gland function and makes it more difficult to sleep. Most people will fall asleep if they listen to relaxing audio tracks. The mellow narration of an audiobook or an ambient music track can help your mind unwind and slow down. 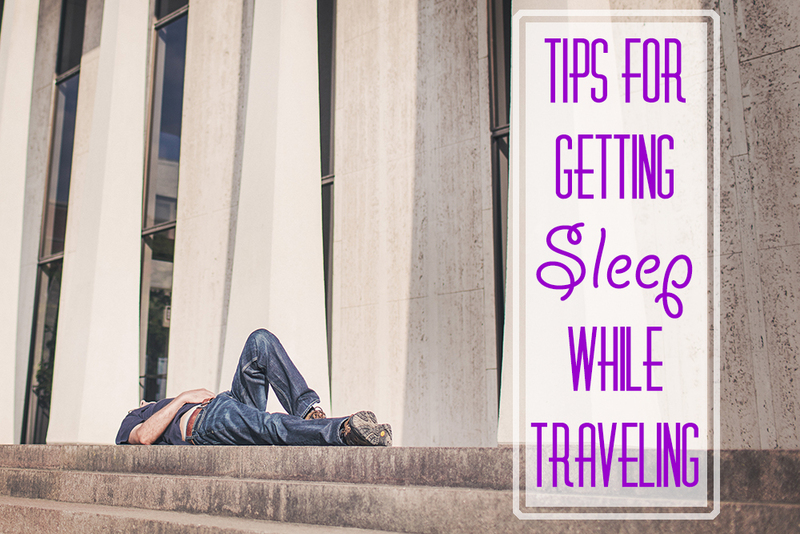 When you’re excited about your trip it can be hard to calm down and get the most of your time sleeping making this a particularly useful travel tip! The most important thing is to remember that you need sleep. While traveling you’re going to be exposed to a host of new germs and opportunities to get sick. A good nights rest will help you stay healthy and make the most out of your trip! I use a few of these already, but I’m going to have to invest in the eye mask. I’ve been thinking about it for awhile and I suppose it’s just time.